A 29-year-old Nassau County police officer who was shot and killed during a traffic stop in Queens on Tuesday was energetic, well-liked, and so devoted to public service that he was also a volunteer firefighter and an EMT, devastated friends and associates said. Arthur Lopez was a highly decorated officer, who started as a patrol officer in the 1st Precinct in 2004, according to Nassau County Police Commissioner Thomas Dale. He had been assigned to the Emergency Services Unit since January of 2010. Dale also said that Lopez was a volunteer firefighter with the Dix Hills Fire Department and an EMT. Nassau County Police Commissioner Thomas Dale and Nassau County PBA President James Carter announce details in the shooting death of police officer Arthur Lopez, 29, on Cross Island Parkway Tuesday. "It's a tragic day for the people of Nassau County and the Nassau County Police Department," Dale said. Nassau County Executive Ed Mangano called Lopez "a true hero." 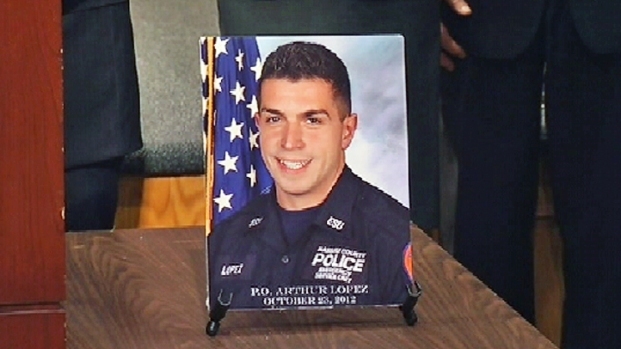 Lopez was just short of his 30th birthday, according to Nassau County PBA President James Carter. "He was full of life, full of energy, a great cop and a great friend," Carter said. Lopez's neighbors recalled his kind gestures. "He was a very nice, friendly man," said neighbor Cathy Rescigno. "It's a tragedy, and I'm sure everyone in this neighborhood is going to miss him a lot." Carter said the police force was still reeling from the death of fellow Nassau County police officer Joseph Olivieri, who was killed last Thursday while responding to an accident on the Long Island Expressway. "To say that this is a difficult time would be an understatement," he said. Lopez is survived by his two parents, Alfonso and Mirella, and a sister, Charo. Flags will be flown at half-staff on all Nassau County government buildings from Nov. 19 through Dec. 19 in honor of Lopez. They're currently at half-staff in honor of Olivieri.